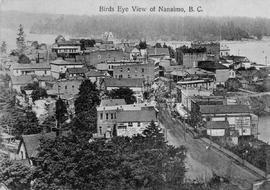 "Bird's Eye View of Nanaimo, BC." 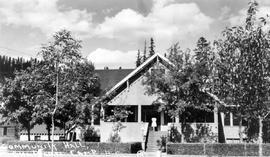 "Hotel Bella Vista Grounds, Agassiz, B.C." "Post Office and City Hall, New Westminster." "Post office and city hall, New Westminster, BC." "South with Cambie Street and City Hall"; Vancouver. "The new city hall, Vancouver." "This is where the boys buildt their boats in the ever-changing tented city of 5,000 at the head of Lake Bennett; Lake Linderman flows in just beyond the cliff on the left." A small settlement on a river. Centennial Balloons Decorate City Street, In Front Of City Hall, Victoria. City Hall Square; Winnipeg, Manitoba. City Hall at Fort George. City Hall, Bellingham or Port Townsend. City Hall, Douglas Street, Victoria. City Hall, Victoria, from the southeast. City Hall, Victoria; this is the first section built; completed 11 Dec 1878. City Hall; from the south side; after the addition of the fire hall; Victoria.